What does stock market milestone mean for you? Stock market reaches new milestone; what does it mean for you? If you don't follow the stock market, or you're the biggest investor--today's developments on Wall Street will undoubtedly affect you. The bull market, which describes a period of time in investing when stock prices continent rise, and when investor confidence is highest, stretched 3,453 days on Wednesday. The remarkable run began on March 9th, 2009 following the aftermath of the Great Recession and the biggest drop in the stock market since the 1930’s. Wall Street might seem like a world away, but it affects your wallet. If you're a first time investor just setting up a 401K account, or if you're getting ready to retire, today's developments will have an impact on the trajectory of your financial future. 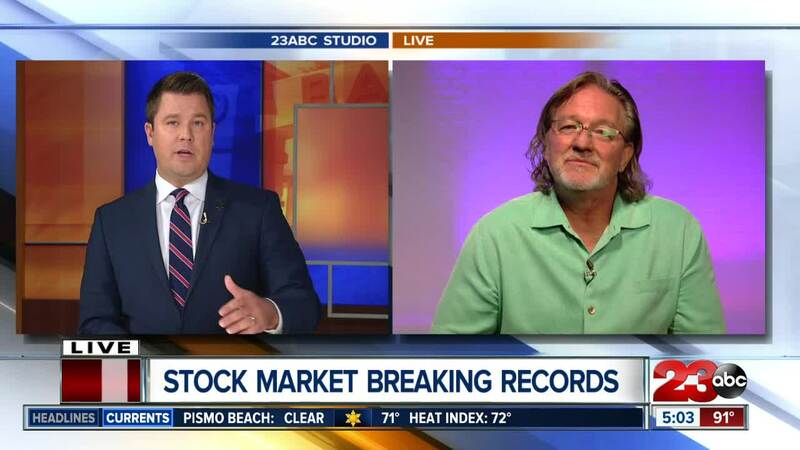 Garro Eillis, a financial advisor and co-founder of Moneywise Wealth Management in Bakersfield joined 23ABC's Tim Calahan live in studio Wednesday to discuss the history day on the market. "For investors they should stick to the strategy," Ellis said. The market isn't showing signs of slowing down despite turmoil surrounding politics and the Trump administration. Ellis says the market has succeed despite a constant barrage of negative headlines surrounding the president. He says as long as people are spending, and consumer confidence is up, this economy will continue to thrive. "If the politics doesn't affect your spending, that's a good thing for the economy," Ellis said. Ellis calls it the 'Trump Trade Effect,' the market he says went up, whether mathematics justified the values or not, but he says recent tariffs imposed by the administration could stand to change that. "Tariffs may be affecting other parts of your portfolio," Ellis said. Foreign and emerging markets are down overall after Trump's tariffs were announced earlier this year, but that may signal an opportunity to diversify your investments. "If you're just investing in United States stocks, you're probably doing then wrong thing," he said. Ellis says he sees more value right now in emerging and international markets, but cautioned the effect of tariffs may still be felt. "I would dip into it," Ellis advised. The best advice Ellis says; diversify and stick to your strategy.